A "full, frank, fearless" inquest will take place into the death of a Wrexham man who died in an incident involving emergency services, a pre-inquest hearing has been told. Police and a paramedic were called to a home in Wrexham on 12 February 2017. 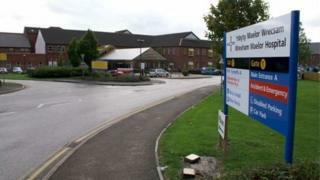 Paul Williams, 39, had "self-inflicted knife injuries" and died at Wrexham Maelor hospital. North Wales Police referred itself to the Independent Office for Police Conduct (IOPC) following the death. The IOPC's investigation into contact with Mr Williams before his death is complete but no further details have yet been published. A full inquest will be held in February or March next year, the Ruthin hearing was told on Wednesday. An IOPC statement released at the time said police said a man had "sustained self-inflicted knife injuries". Assistant coroner David Lewis said the case was a "heartbreaking story" and told Mr Williams' family he wanted to make sure the inquest would be "a full, frank, fearless investigation into what happened". He will consider whether the inquest should be enhanced under the European Convention of Human Rights, which looks at cases where the state or its agents may have failed to protect someone against a human threat or other risk. They can also include inquests where the deceased has been under the care or responsibility of social services or healthcare professionals. Wednesday's hearing was told Mr Williams was known to mental health and substance misuse services, and the inquest will hear evidence about his medical background and lifestyle. It will also hear evidence of the use of a police Taser "and why the Taser appears not to have been effective".